Somehow I lost my RSS feed to Danny Zacharias' Deinde blog, and so I am now catching up. I have commented a number of times on Unicode, but I am only familiar with how it works on a Windows PC. For those wanting to know how to manage Unicode on a Mac, be sure to check out this post on Deinde. 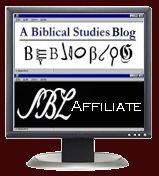 Logos Blogroll Promotion: Free Logos Books! "Bible Mapper" is back... and now free!